These issues were surfaced by an organization that called itself “The WWII Civil Air Patrol Preservation Project.” [“CAP2P” for short.] The co-founders of this organization are Lt Col Ray Lyon, Vice Commander of the New Hampshire Wing, and his friend, Spencer Morfit. Lt Col Lyon is retired USA F and has a 26 year career in new business development for a major defense contractor. Ms Morfit has 30years’ experience in corporate communications and marketing. Because Lt Col Lyon is my Vice Commander, because he introduced me to Ms. Morfit, and because I was working with the Project to place a Stinson 10-A from the Falmouth, MA, Coastal Patrol Base #18 that belonged to my late husband, I am well acquainted with both of them, the Project, and with these events. I am in receipt of your lengthy letter of May 16, 2005 in which you ask minimal cooperation of the Civil Air Patrol in the Collings Foundation’s project to preserve and promote the history of Civil Air Patrol. As we have stated earlier, Civil Air Patrol has founded the Civil Air Patrol Historical Foundation (CAPHF) to accomplish many of the objectives you have stated for your project. Civil Air Patrol is committed to supporting the CAPHF and its executive director, Drew Steketee. As we’ve already advised you, Civil Air Patrol believes the name “WWII Civil Air Patrol Preservation Project”, even with an asterisked disclaimer, can easily be perceived by the public as representing Civil Air Patrol, and we expressly deny permission to use our statutorily protected name in this way. You noted in your letter that the project began as a small personal project of Ray Lyon’s to restore a Stinson 10-A that flew from Base # 18 (Falmouth, MA) in the Coastal Patrol, fly it to air events to attract recruits to the CAP cadet program, and eventually place the plane on permanent display in a museum. Civil Air Patrol and CAPHF are pleased to assist in this effort by providing technical advice for authentic restoration and paint masks in exchange for a donation to CAPHF. You state that your program, beyond restoring the Stinson, “then took on a life of its own.” With all due respect, your program to preserve and promote the history of the Civil Air Patrol and to raise funds to do this, is not a Civil Air Patrol program. It has not been approved by the Civil Air Patrol National Board or Board of Governors. Neither you, nor the Collins Foundation has been commissioned by Civil Air Patrol to take on this project. 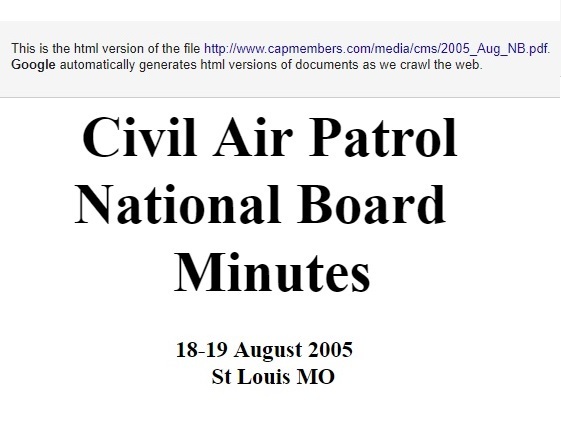 You have not approached Civil Air Patrol to publish a book of CAP’s history on behalf of CAP. You have not been authorized by CAP to raise funds from corporations and major donors, or anyone else,on behalf of CAP. The CAPHF has advised you of the terms and conditions under which it would make available its collection. CAP has not asked you to make commitments to publishers or to a documentary film producer. Whether income from your project goes to you or to CAP2P, the point is that it is not coming to CAP. In that sense, it is “commercial”. It is some organization other than CAP financially benefiting from the use of CAP’s name and photograph collection. I have a great deal of respect for the Collings Foundation and the work it does in the field of aircraft preservation. However, the Collings Foundation is not the Civil Air Patrol and is not responsible for preserving the Civil Air Patrol’s proud history. Please understand that this is business and not personal. Like you, we have responsibilities to our organization, CAP, as I hope you understand. To reiterate what I’ve already told you, CAP and CAPHF stand ready to assist in efforts to accurately restore historic aircraft, to review materials for historic accuracy, and to furnish materials that are made available to the public by the CAPHF under terms developed by its executive director. These are the same services we offer to any other member of the public -nothing more, nothing less.Please let me know if I can assist you in providing these services. Be the first to comment on "Dear Ms. Spencer Morfit"